An alternative Brexit strategy put forward by hardline Tory Eurosceptics has been branded “vague and contradictory” by a senior DUP figure. Sammy Wilson, who has previously called for the prime minister to rip up her controversial Chequers blueprint for Brexit, said his party could not endorse a rival plan launched on Monday by leading Brexiteers, including David Davis and Jacob Rees Mogg. The so called Plan A+, published by the free market Institute of Economic Affairs (IEA) think tank, urges ministers to seek a “basic” free trade agreement for goods and pursue “regulatory freedom and trade independence”. Regarding the thorny issue of the Irish border, the strategy says there should be a new backstop option, which involves passing new laws specific to NI. It says Northern Ireland should be treated differently to the rest of the UK to avoid a hard border, retaining all EU agricultural health checks, and proposed checks for other products, such as medicines, should be carried out away from the Irish border. The plan also says the UK should pass a law making it a crime to export or knowingly freight “non-compliant” goods to the “Irish market”. DUP Brexit spokesperson Mr Wilson said the proposals contain “inconsistencies” and felt questions needed to be answered about the scope of the plans. He told the News Letter: “I am not sure if this report is deliberately vague or just not very well thought out. “It talks about the goods which are regulated differently in EU member states, and uses the phrase ‘of which there are many’. Are they saying that the UK government would commit to, or the NI Executive would be required to commit to, copying all of the EU regulations in relation to that myriad number of goods? That is not clear. “Also, if there was a commitment to UK law being changed only in relation to NI on a whole range of goods, then what does that do to the government’s guarantee that we would not be divorced from our main market in GB? “For example, if the EU changed regulations on what you could have in some processed foods, would we be tied to that and would that then restrict our ability to sell to GB market? 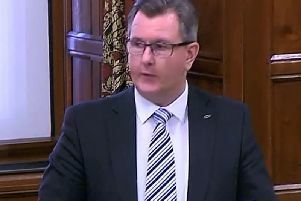 The East Antrim MP also spoke of “contradictions” contained in the report, adding: “It talks about checks being done away from the Irish border, and I have no difficulty with that. Given his reservations, Mr Wilson said the rival Brexit plan “is not something we (the DUP) would support”.